Guarana is used as a dietary supplement and an ingredient in energy drinks, soft drinks, and nutritional supplements. If you are lacking energy and seeking a quality supplement to improve your energy levels, you may want to try a supplement that contains this ingredient. Brain Enhancement Advisor offers information and product reviews about supplements. This climbing plant grows along the Amazon River basin and is well known for its large leaves, clustered flowers, and particularly for the seeds of its fruit, which are used as a dietary supplement. The seeds are about the size of a coffee bean, but contain double the amount of caffeine. The name translates to fruit with eyes of the people, due to the resemblance of the fruit to the human eye, and is featured in cultural stories. This plant has been used in its indigenous regions for many centuries and was introduced to Europe in the 1500s by Spanish colonizers. 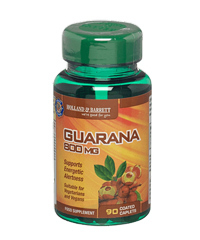 Guarana is used in herbal teas, energy shots, soft drinks, and supplements. The primary benefit is increased energy, which is the reason it used as an ingredient in energy drinks and supplements. In addition, there is some evidence that suggests this substance may promote weight loss by making the body feel full sooner. The dosage of this ingredient depends on how it is taken. The amounts can vary in different soft drinks, energy drinks, and supplements. The amount that is taken will also change the dose. It is better to start off with a lower amount and then gradually increase it. You should keep in mind that side effects are more likely with larger doses. The side effects of guarana depend on the dose and are more common when the product is taken in larger doses. Some of the side effects may include nausea, vomiting, increase blood pressure, rapid breathing, irregular heartbeat, anxiety, and irritation. In addition, there are some contraindications. The ingredient may complicate blood sugar control for diabetics, can make anxiety worse in people prone to this problem, and may cause irregular heartbeat in people with heart trouble. At Brain Enhancement Advisor, we have product reviews of several products for energy and improving memory, focus, and concentration. We encourage you to read our product reviews and compare products to find supplements that will deliver the results you are seeking. The comparison chart on our website makes it easier to compare products.